The past does seem a strange place, sometimes. An item which made its way to the archives this week is a case in point. This object was originally given out as a prize at the Lucky Strikes Lanes, the bowling alley which was where the Deseronto Public Library (and the Archives) is now. It was run by Ernie and Gladys Luck – and Gladys’s apple pie was legendary, it seems. Even as recently as the 1960s or 1970s, it was perfectly fine to hand out an ashtray as a prize. It’s hard to imagine this happening today! We’re not sure who donated this object to the Library – so please let us know if it was yours! When an archives’ focus is geographical, as ours is, there is often reason to be thankful for the fact that a town has a fairly unique name. This makes it easy to take advantage of the increasing number of online resources around the world which allow searching of historical materials by keywords: there aren’t any other Deserontos, so when we find a hit, we can be fairly sure that the article or book in question is about this town. A story of an extraordinary tug-of war comes from Canada. 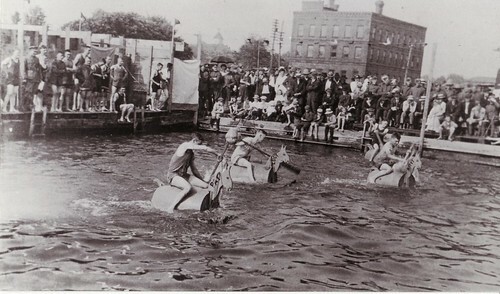 At an athletic meeting held at Deseronto, Canada, on Jubilee Day, two teams, styled Picton and Deseronto, were down for a tug-of-war, seven men aside, one pull of 3ft. to a finish : and for the record time of 2h. and 10min. those fourteen men strained every muscle in the glaring sun without any apparent advantage. Picton secured eight inches in the first hour, which Deseronto reduced to nil, but could not get it over scratch 1/16th of an inch. They, however, held it there for half an hour, when Picton again, by fractional parts, got 7in. ; and the judge, after consulting the captains, decided to call it a draw in Picton’s favor, as the condition of some of the contestants did not warrant a continuation, although they were all averse to a draw. Stimulants had to be administered to every man frequently, and applications of cold water and rubbings were in order. This story appeared in Victoria’s Traralgon Record and Bairnsdale Advertiser newspapers in October 1897, some four months after the event itself took place. News evidently travelled more slowly in 1897 than it does today. The tug-of-war was one of a series of events held on June 22nd. The advertisement in Deseronto’s own newspaper, The Tribune, on June 18th proudly proclaimed that “This will be one of the most imposing celebrations ever held in the Bay of Quinte District”. the Picton team was organized by Mr. Taylor of the Bank of Montreal in 1892 and…has never been beaten. Mr. Taylor only induced them to come here on the understanding that he would not captain or coach their opponents, so that there might be fair play for all. He did, however, show the home team the correct position for pulling, a most important point. To those who think the pull should have had a time limit we are informed that it was conducted on precisely the same lines as the great international pull at Madison Square garden New York in 1892. We missed the opportunity of organizing a rematch at last year’s Diamond Jubilee celebrations, but maybe if Queen Elizabeth II is still on the throne in 2022 we could arrange a re-run of the event for her Platinum Jubilee. With nine years in which to practice, perhaps this time Deseronto will win! 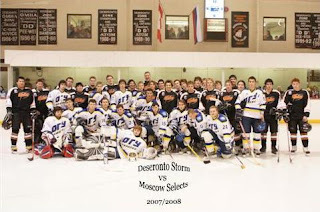 Deseronto Storm (usually known locally as ‘The Storm’) is the junior hockey team that many people in Deseronto and surrounding areas follow with keen interest nowadays. 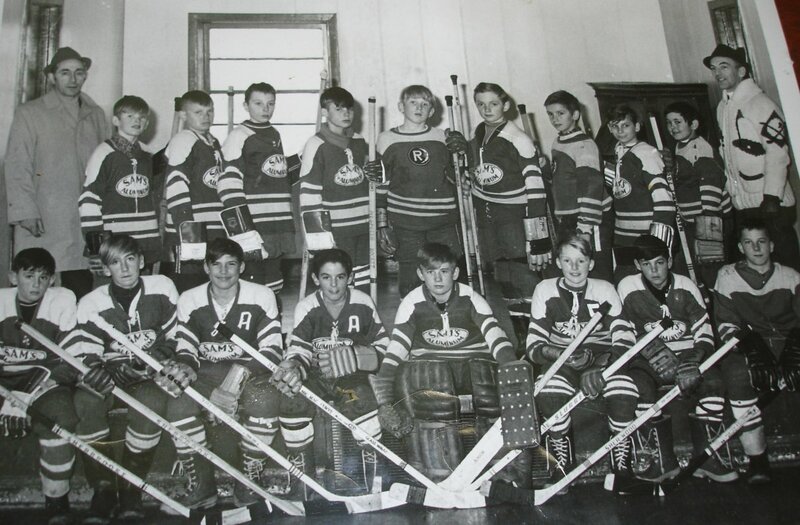 Back in the 1920s the town had another successful team, this one made up of young men from the Deseronto High School. 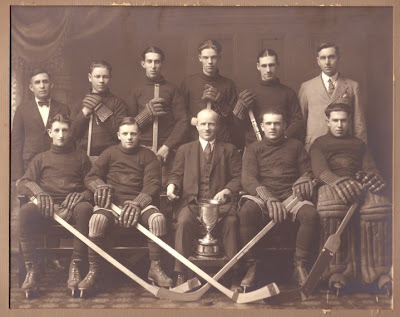 They were the Central Ontario Inter-Scholastic League Champions in 1926 and 1927. 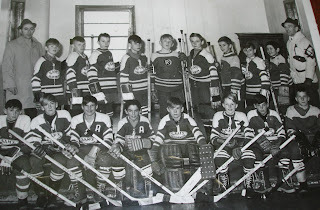 Mary Hird, the daughter of Charlie Cole, the left defence player, has lent images of the two Deseronto High School teams to the Archives so that we could copy them and share them with others. FRONT ROW (left to right) – L. Bruyea, left wing; F. Whitton, centre; M. Detlor, right wing. ; C. McVicker, goal. BACK ROW (left to right) – J. Whitton, Manager; J. McVicker, Mascot; L. McVicker, sub. ; M. Perry, right defence; C. Cole, left defence; F. Butzer, sub. ; E. I. Gale, Principal of Deseronto High School. James McVicker (1909-1974), the team’s mascot, is already familiar to us as the drummer in the ‘Circle Six Orchestra’, whose photograph has featured on the blog before. That photograph was clearly taken in the same photographer’s studio as these two. FRONT ROW (left to right) – M. Detlor, right wing; F. Whitton, centre; J. Whitton, Manager; L. Bruyea, left wing; C. McVicker, goal. BACK ROW (left to right) – B. Brant, coach; G. Green, sub; L. McVicker, right defence; B. Campbell, sub; C. Cole, left defence; A. D. Campbell, Principal. Daniel Clarence McVicker (1907-1985), the goaltender for both teams was later to become a physician and worked as a doctor in Deseronto for many years. If you have further information about the other members of the team, please share them in the comments. To modern eyes, the difference in the levels of equipment between these players and those of today’s is quite striking. As is the complete lack of logos on the 1920s teams’ kit! The Kimmett family donated this photograph to Deseronto Archives today, in memory of Don Kimmett. 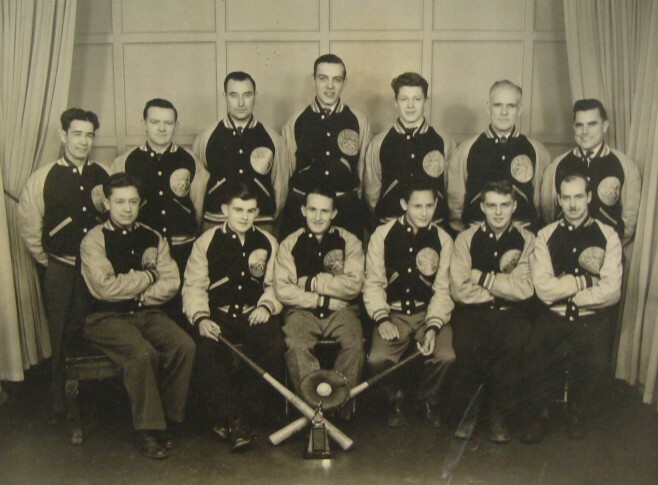 It depicts the manager, coach and team members of the Deseronto Baseball Club, who were Bay of Quinte League champions in 1950. As St. Valentine’s Day approaches, Deseronto Archives investigates a love story that began on the Mohawk Reserve (now known as the Tyendinaga Mohawk Territory) one hundred years ago. 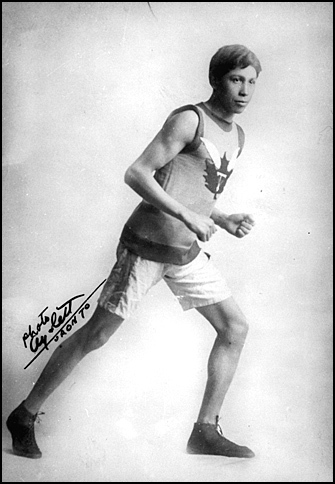 One of the most famous Canadian athletes of 1908 was Tom Longboat, a marathon runner with a string of successful races to his name. He was born in 1887 to Onondaga parents in the Six Nations of the Grand River Indian Reserve. His first major race victory was at the 1906 Around the Bay Race in Hamilton, Ontario. In 1907 he won the Boston Marathon and the following year he went to London, England, to run in the Olympic Games. Unfortunately he did not manage to complete that marathon, as he collapsed after running 19 miles (30 kilometres) in hot and humid conditions. Longboat turned professional in November 1908 and it seems to be at about this time that he met Lauretta Maracle, who was described by the New York Times as “an Indian school teacher” at the reserve near Deseronto. The Albuquerque Citizen has an intriguing report about the couple’s courtship (which manages to get Lauretta’s name completely wrong). They planned to marry at Massey Hall in Toronto, after a benefit performance on 28 December 2008. Lauretta was an Anglican and the New York Times noted on 20 December that Tom was to be received into the Anglican Church the next day. A last-minute snag was reported in the same paper on December 27, under the headline ‘Ban on Longboat Wedding’. The Archbishop of Toronto, Arthur Sweatman, had written to Rev. Alfred H. Creeggan of Deseronto, who was due to conduct the ceremony and told him not to, as he believed that Tom’s conversion was too sudden and therefore unlikely to be sincere. Other Anglican ministers were also prohibited from presiding over the wedding, but the marriage did go ahead, although it is not clear who officiated. The union between Tom and Lauretta was ill-starred, however, as Tom was reported missing, presumed dead, during the First World War and Lauretta married another man. On Tom’s return she decided to stay with her new husband. Shortly afterwards, Tom also married again, to Martha Silversmith, who was from his own Six Nations reserve. There are no images of Lauretta available, but this photograph from Library and Archives Canada (C-014095), via the Wikimedia Commons site shows Tom in his prime (although his pose looks far from natural). I’m hoping these questions will be easy ones for Deseronto folk to answer. 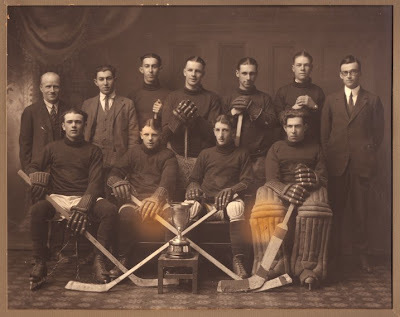 This photograph was received at the Archives this week, but without any supporting information to explain who the hockey team were, or when the picture was taken. The firm sponsoring the team, Sam’s Aluminum, was established in Napanee in 1963, so that gives us the earliest possible date for the photo. It became Sam’s Doors and Windows in 1971 (according to the company’s website), which presumably gives us the latest possible date. What is the name of the hockey team? Do you recognise any of the players or the men in the photo? You can click on the picture to see a bigger version. No prizes available for correct answers, but any assistance will be gratefully received!